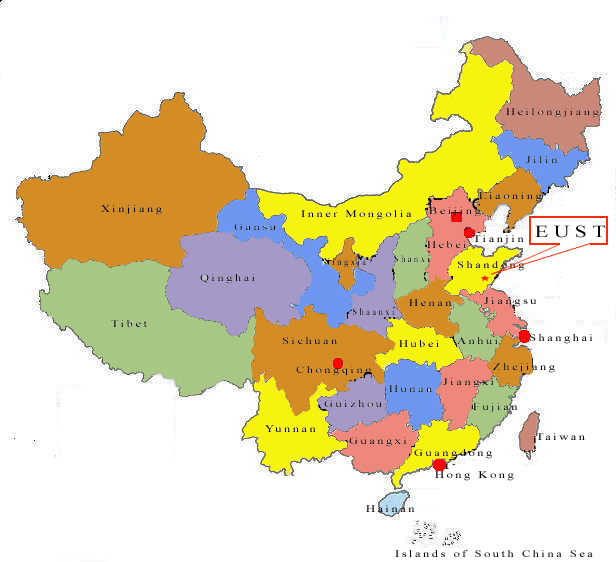 EUST is located in Linyi Municipality, a city in the southern Shandong Province, People's Republic of China. Linyi is about 150 kilometers from two major seaports, 700 kilometers south of Beijing, the capital city of China, and 700 kilometers north of Shanghai, the largest commercial and financial city in China. Linyi is located near the expressway connecting Beijing and Shanghai. Linyi Airport, capable of accommodating Boeing 737 aircraft, connects Linyi to the major cities of China, including Beijing, Shanghai, Guangzhou, Dalian, Shenyang, Wenzhou, Jinan and Qingdao. There are several major national highways and railways that run through the Linyi area. The Linyi Municipality has a population of 10 million.